Theyyam (Teyyam, Theyyattam or Thira) is a popular ritual form of worship of North Malabar in Kerala, India, predominant in the Kolathunadu area (consisting of present – day Kasargod, Kannur Districts, Mananthavady Taluk of Wayanad and Vadakara and KoyilandyTaluks of Kozhikode of Kerala) and also in Kodagu and Tulu nadu of Karnataka as a living cult with several thousand-year-old traditions, rituals and customs. The performers of Theyyam belong to the lower caste community, and have an important position in Theyyam. People consider Theyyam itself as a God and they seek blessings from this Theyyam. 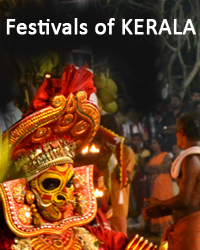 Travel with Kabani and learn more stories on these festivals. Please write to us on [email protected] for more details on the tour and to book this program.